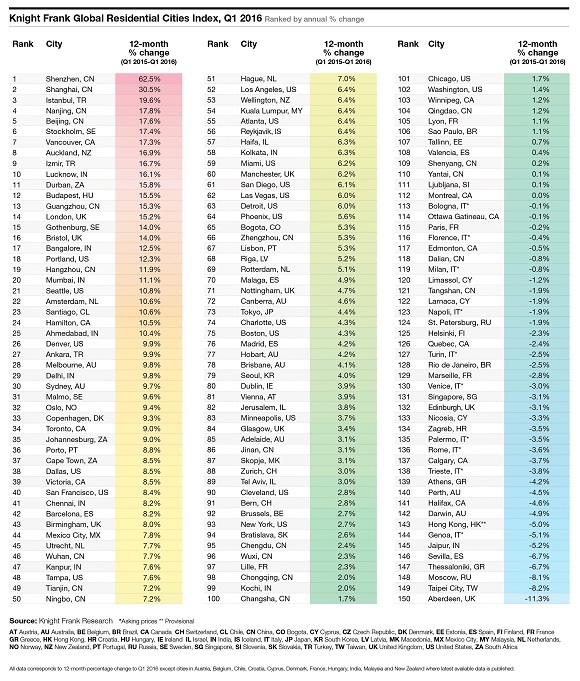 Seventy-four percentage points now separate the world’s strongest and weakest-performing mainstream city housing markets. Kate Everett-Allen examines the latest set of results. 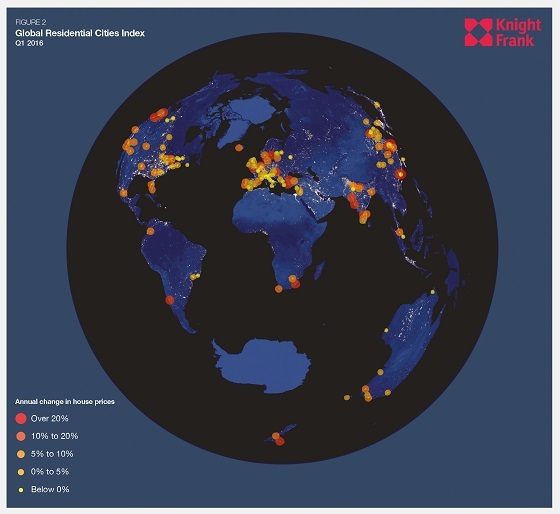 The Global Residential Cities Index, which is based on official house price data published by either National Statistic Offices or Central Banks, for 150 cities across the world, increased by 4.5% in the year to March 2016. 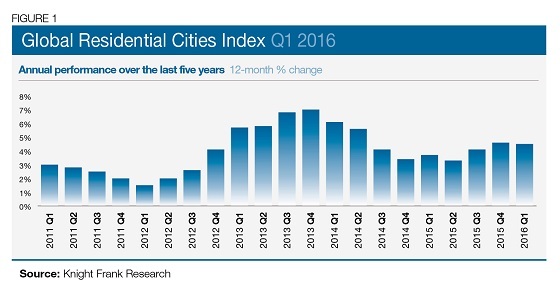 Seventy-four per cent of the cities tracked by the index saw house prices rise in the year to March 2016. The gap between the strongest and weakest performing housing market has expanded from 55 percentage points last quarter to 74. The widening gap can, to a large extent, be attributed to the phenomenal rate of growth recorded in the Chinese city of Shenzhen. This rapidly-expanding technology hub, located within 11 miles of Hong Kong, saw annual price growth jump from 48% last quarter to 63% in the year to March 2016. Chinese cities now account for four of the top five performing cities but new measures introduced in March in some Tier 1 cities such as Shenzhen and Shanghai are likely to lead to more muted growth during the remainder of 2016. The new rules range from higher down payments for first and second homes as well as longer residency requirements for non-locals wishing to purchase. Scandinavia is emerging as a key centre of growth. The cities of Stockholm, Gothenburg, Malmo, Oslo and Copenhagen all recorded annual price growth of between 9% and 17% in the year to March. Low levels of new supply, high demand and cheap finance are fuelling price growth across the region. Vancouver continues to be North America’s stellar performer, prices ended the year to March 17% higher. A proposal by Mayor Robertson to tax empty homes is under discussion as a means to increase rental supply and address the lack of affordable homes in the city. 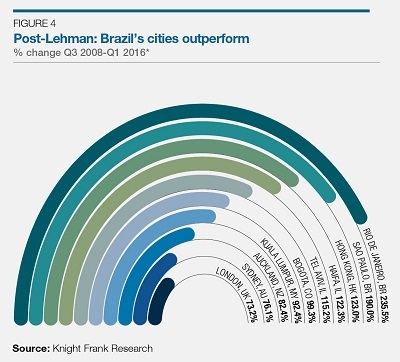 Despite the recent slowdown in their economies and fall in sales, analysis post-Lehman highlights the extent to which cities in emerging markets such as Rio de Janeiro, Sao Paulo and Bogota still stand out, having recorded price growth of 236%, 190% and 99% respectively in the eight years since 2008. (figure 4). The data under analysis covers the period to Q1 2016 but looking to the future, all eyes will now be on the UK’s decision to leave the EU and the impact it has on property markets, not just in the UK but globally. Future domestic demand will be linked to the direction of interest rates, changes to mortgage rules and employment growth whilst currency shifts will be the key determinant of cross-border investment. All data corresponds to 12-month percentage change to Q1 2016 except cities in Austria, Belgium, Chile, Croatia, Cyprus, Denmark, France, Hungary, India, Malaysia and New Zealand where latest available data is published.